Creating Healthy Smiles for all Ages. 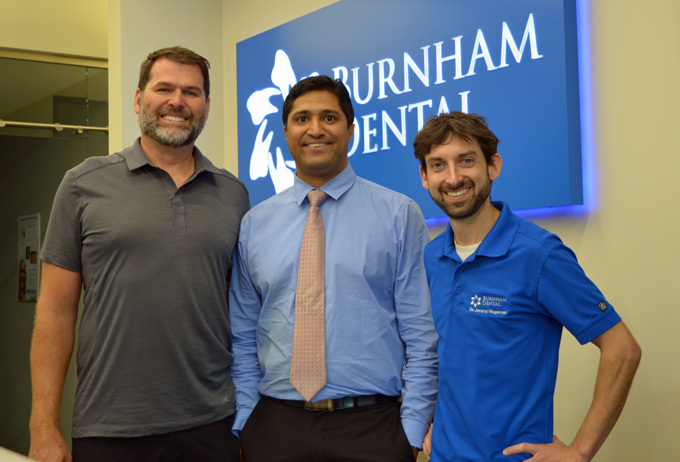 Dr. Brian Smith and his Associate Dentists, Dr. Pankaj Kumar and Dr. Jeremy Wageman want to be your choice for dental care in Peterborough, The Kawarthas, and Central Ontario. Our team of dedicated professionals will provide a complete range of exceptional dental care that is also affordable. We take pride in our patient-centered, responsive approach and spa-like service. We are caring and compassionate and our team works with patients to approach dental care preventatively, helping them make informed decisions about their dental health. We have an extensive Kids program, offering services such as Silver Diamine fluoride or SDF and SMART fillings, sedation and Laughing Gas, in an environment catering to your child’s experience, A kids zone equipped with a Thomas the Tank Engine play table, a find Waldo wall and two X-Box One Stations, TV’s in the treatment rooms, and free Wifi. We are here to treat your emergency dental needs. Along with our focus on prevention, Burnham Dental offers a full range of Cosmetic Services, we can address any issue you may have with your smile, through the use of Whitening, Veneers, Crowns, Bridges, Bonding, and other esthetic restorations, together we can create the smile you have always dreamed about. If missing teeth are an issue, Burnham Dental offers all the options for replacement, we take pride in our denture services, from partials & completes to fixed and implant supported dentures, we have the solutions to ill-fitting dentures and options to work within your budget. Burnham Dental provides complete Dental Implant services, from placement, restoration, to follow up care. We can provide immediate dental implants, at the time of tooth loss, even in the molar region. We are your office for comprehensive rehabilitations and all-on-four treatments. Our Practice has been serving Peterborough since 1971 and we are passionate about what we do, choose us to be your Peterborough Dentist.